Go ziplining and raft on the Cetina River. Learn to kite surf off the Dalmatian Coast with private instructor. Private guided hiking and caving in Paklenica National Park. 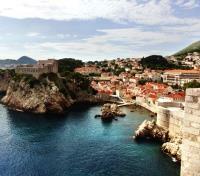 Witness ancient city walls rising behind you as you kayak off the coast of Dubrovnik. 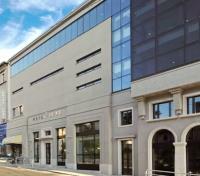 Curated collection of 4* accommodations. The varied landscapes of Croatia offer up a natural wonderland for those seeking a bit of fun and adventure with their Adriatic exploration. Please note: some activities are weather dependent, and are only offered between May and October annually. 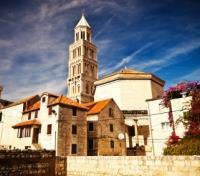 Enjoy a private transport to Zadar Airport. This morning meet your guide at the hotel lobby for a private museum tour of Zadar, the town of rich cultural and historical heritage. 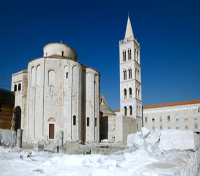 An ancient Greek foundation under the name of Iader, later an important jewel in the Venetian crown as Zara and today the centre of the region, Zadar is a town-monument with layers of history that can be revealed on every step. Centuries-old tumultuous history, numerous destructions and reconstructions have left scars but also a rich historical legacy and today's valuable monumental heritage of the city. Your guide will take for a walk through the cobblestone streets, from the church of St. Donat and the Cathedral of St. Anastasia, to the Benedictine convent of St. Mary and the largest Roman forum on the East of the Adriatic, founded by the first Roman Emperor Augustus. You will visit the Permanent Exhibition of Religious Art, popularly called The Gold and Silver of Zadar; that houses the priceless exhibits of sacral treasure of Zadar. All the hopes, believes and testimonies of this region’s history are woven into the relics, sculptures, paintings and embroiders. The particular charm lies in the fact that these valuable items have been preserved by the Benedictine nuns throughout the years. Additionally, today you will have a chance to visit the unique Museum of Ancient Glass that narrates the history of this region in the most distinctive way. The museum contains one of the premium collections of Roman glassware, with exhibits retrieved from archaeological sites across Dalmatia. Highlights include the delicate vessels used by Roman ladies to store perfumes, skin creams and essential oils. Also look out for glass cups used to celebrate Mass, and dainty flasks in which holy water was stored. 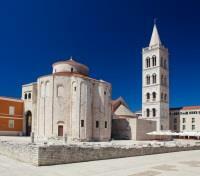 During your tour, you will also discover some contemporary attractions of Zadar. One of them is the Sea Organ, the site that is a blend of human ideas and the energy of the sea, a place for relaxation and contemplation with the sounds of the endless concert of the "Orchestra of Nature". Walking further down the waterfront, you will discover the “Greeting to the Sun”, an impressive urban installation. Simultaneously with the “most beautiful sunset in the world”, the lightning elements turn on and produce a marvelous light show in the rhythm of the waves and the sounds of the sea organ. Hotel Bastion is a unique city boutique-hotel which accentuates the cultural heritage of the city of Zadar.It is located in the historic center, and is built on the remains of the medieval fortress “Kastela” from the thirteenth century; an invaluable monument of medieval fortification in Zadar. The property offers 28 luxury equipped rooms, each with rooms with hand-made furniture and LAN Internet access, an assortment of gastronomic delicacies and a wellness center. 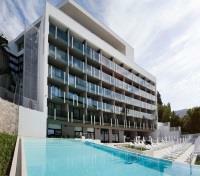 It is a mere stone's throw from the Cultural monuments of Zadar and the renowned "Sea Organ" and "Greeting to the Sun". Choose to dine at the Kastel restaurant or on one of the sunny terraces of the hotel and enjoy the menus which are based on Mediterranean cuisine, with local dishes and healthy foods. The aperitif bar "Kristal" offers a wide array of cocktails, afternoon tea or coffee - the perfect early evening backdrop after doing some exploring. Meet your private driver at your hotel for a transfer to the historical town of Nin, a 10,000-year old settlement nestled on the eastern shore of the Adriatic. Your instructor will meet you on arrival for a private kitesurfing lesson where you'll be outfitted with equipment to ride shimmering blue waves. 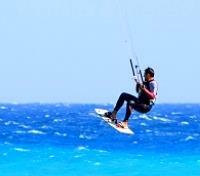 A relatively new extreme sport, kitesurfing is one of the most dynamic and exhilarating activities on the water. Great speed, high jumps, dizzying combinations of tricks and the purity of riding the waves have made kitesurfing extremely popular around the globe. Learn to kitesurf under the guidance of your personal instructor with the beautiful sandy beaches of Nin as your backdrop. Your adventure on the water concludes with a private transfer back to your hotel. Meet your private driver and set out on a drive to Paklenica National Park. Paklenica is a part of the Velebit mountain range, the largest in Croatia, offering an exciting mixture of high peaks with stunning views, deep gorges, and pine forests. Ideal for those with an adventurous spirit, hiking is the best way to explore this wonderful national park. Paklenica is best known for its two canyons, Velika and Mala Paklenica, as well as numerous caves and rich flora and fauna. At the entrance to the park, you'll meet up with a private hiking guide who will take you on a scenic 1.5-hour hike to the interior of th epark, keeping your eyes peeled for wildlife including various types of birds, deer, bears and wild cats, as you make your way to the Manita Pec cave. Explore this beautiful cave and its curiosities, discovering its unspoiled beauty on a 30-minute guided experience in the cave. Afterward, you'll hike back out of the park with your guide, meeting up with your private driver for a return transfer to Zadar. Note: While your private guide will accompany you inside the cave, entrance at Manita Pec is solely done on a group basis with a specialized Cave guide. Today you will transfer from Zadar to Split with your guide and driver en route relish a full day exploration of the Krka National Park and the town of Sibenik. Enjoy a 20 minutes boat ride from the town of Skradin to beautiful Skradinski Buk waterfall. For thousands of years, the Krka River has obstinately hollowed out its path through rock and has created the remarkable waterfalls. In the year 1985, its remarkable beauty was recognized and placed under protection proclaiming the national park. The area of the national park also preserves many cultural and historical monuments, but the most interesting for the visitors is the ethno village that has preserved the old crafts and way of life. After this relaxing tour, your guide and driver will take you for a short ride to Sibenik, a medieval town with the famous Cathedral of St. Jacob. A view of Sibenik reveals the unique harmony of urban poetics of the town and its natural surroundings. 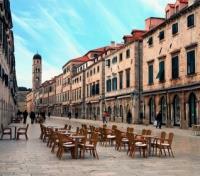 The walk through town with your guide will unveil the beauty of Sibenik and its landmarks. The most famous monument is, by all means, the St. Jacob’s Cathedral, a Gothic-Renaissance masterpiece that has earned its place in the UNESCO World Heritage List. It is entirely built of stone, no other material was being used, which is unique not only in the Croatian architecture but in the European as well. After the tour, you will drive for 1 hour 45 minutes with your guide and driver and transfer to Spilt. Entrance fees to the National park including boat ride from Skradin to Skradinski Buk and entrance fee to the Cathedral of St. Jacob in Sibenik are included. Set out on foot with your private guide as you embark on a walking tour of historic Split, a 1700-year-old town widely recognized as home to Diocletian's Palace, a UNESCO World Heritage Site. You'll visit this living monument, initiated back in 293 AD as a place for Roman emperor Diocletian to live out his final days. You'll discover the basement halls of the Palace and the unique role they played in the history of Split. Discover the Peristyle, the monumental courtyard of the Palace which gave access to the imperial apartments, Diocletian's mausoleum, and the three temples built to the west. You'll visit the Cathedral of St. Domnius (named after the patron-saint of Split), the temples of the Palace, as well as the suites of the Emperor. Wander by a colorful green market and a picturesque waterfront promenade favored by the locals. 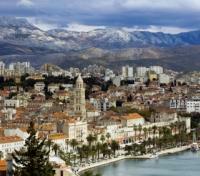 Experience the varied beauty of the town, its rich cultural heritage and the relaxed atmosphere that makes Split a one-of-a-kind Mediterranean town. Continue your exploration of Split by climbing Marjan Hill, popularly known as ''the lungs of Split'', rich in scenic views and lush greenery. 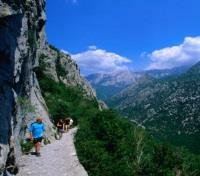 Hike or stroll in the pine woods, enjoying the nature and beautiful panoramic views of Split and the surrounding area. 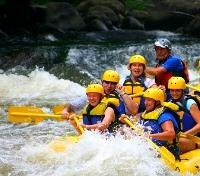 Adventure awaits on a full-day private rafting and zip-lining excursion. Meet your private driver for a transfer into the countryside village of Zadvarje where you’ll meet up with a private rafting instructor. You’ll be taken through technique and safety instructions before getting geared up for a thrilling 3-hour rafting experience on the Cetina River. The Cetina River canyon is one of the most beautiful canyons in Croatia, and a nature lover’s dream. Enjoy beautiful natural scenery as you work with your instructor and navigate through calmer sections as well as tackle the rapids along the river. Return to dry land where you’ll be treated to lunch at a local restaurant, then set out on your next daring feat that follows – soaring across the canyon on a zip line! Ideal for those seeking an adrenaline rush, the highest zip-line wire is set 492 feet above the canyon and features incredible views. The 3-hour experience provides a thrill while discovering a breath-taking and unique perspective of Croatia's natural landscapes. Your day of adventure concludes with a private transfer back to Split. Meet your driver for a private transfer to Dubrovnik with a stop in Ston with wine, oyster tasting and mussels cooking presentation. Upon arrival to Ston, you will meet your local private guide for a tour of this small town famous for its defensive stone walls, which protected the precious salt pans that contributed to Dubrovnik Republic's wealth. The history of the salt works in Ston is more than 4,000 years. It is the oldest salt mine in Europe, and among the working ones, also the oldest in the world. Your guide will take to visit the salt pans, as well as impressive Ston city walls. Continue to Peljesac Peninsula, also known as Croatia’s Napa Valley, to enjoy a private wine tour at the Milos winery. Quality soil and beneficial Dalmatian sun allow the grapes to produce abundant grape bunches, traditionally used to make Croatia's most renowned wines: "Dingač," "Postup" and "Plavac." Today you will meet the Milos family who grow their own produce and maintain vineyards boasting fantastic wines. Take a tour through the vineyard set on the steep manually farmed terraced land of the Pelješac Peninsula. The vineyards are maintained completely organic, which follows natural winemaking techniques combined with extended aging in large Slavonian oak barrels. This guarantees great elegant wines with an intense expression of the nature of Peljesac (a reflection of the terroir) and Plavac mali cultivar. In Ston, you will enjoy an extraordinary experience – a private tour of Ston oyster farm by a fisherman boat and oyster tasting. Your host, a local oyster farmer, will take you for a boat tour of his oyster farms and explain how the oysters are grown and why these particular oysters from the Mali Ston Bay have been recognized as the best aphrodisiac since the Roman times. During the boat tour, you will have a stop at your host’s private island, where you will be treated to an oyster tasting and traditional Dalmatian dish – "mussels alla buzzara." 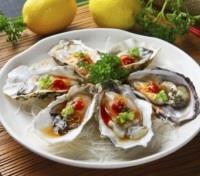 Relax and enjoy these delicacies under the shade of pine trees. Continue to Dubrovnik. Meet your private driver at your hotel for a transfer to where you meet your instructor. Your adventure on the sea starts beneath the fort of Lovrijenac, nearby Pile gate. Easy rowing in kayaks round the old walls are an extraordinary experience to get to know the city of Dubrovnik from the sea. The magnificent walls rising from the sea and the view of the old harbor will make an unforgettable effect on you. After paddling round the walls you will reach the hidden cave beach of Betina, very close to the city, and have time to relax and sunbath or snorkel! 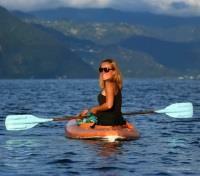 After your relaxation time, paddle back to the starting point and return to hotel by private transfer. All equipment is provided for you. 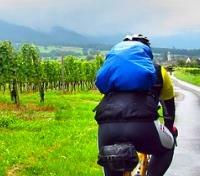 Embark on a bicycling tour of the untouched nature of the Konavle valley. 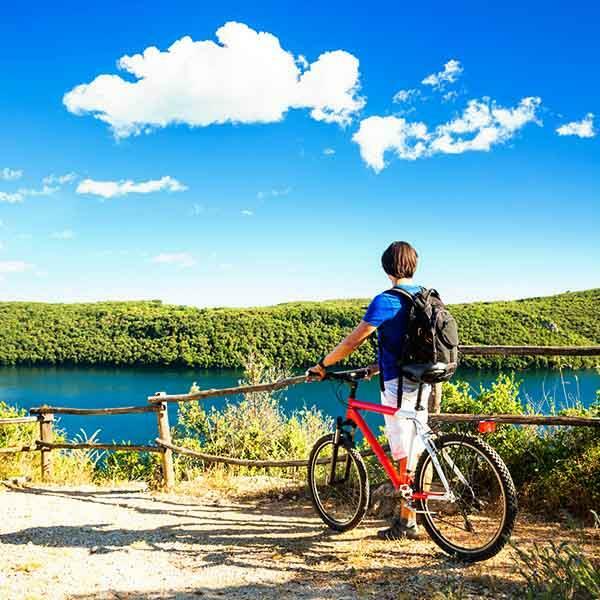 Begin with a short transfer with private driver to meet your instructor and gear up for a private biking tour of the Konavle, the stunning countryside of Dubrovnik. This is a region of contrasts and exceptional beauty, with mountains and valleys, green hills and naked stone. You'll take small village roads that run across the lively Konavle, riding through orchards, corn fields, vineyards and blueberry fields. At the end of the ride, you'll visit a local wine cellar, where you'll be treated to a wine tasting of some famous local wines, paired with a traditional snack. 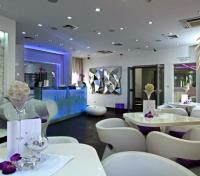 Afterward, you'll transfer by private vehicle back to your hotel.